As the Founder of the Tattooed Moms Club I guess it’s only fair that since I’ve been interviewing all of you to be featured on the blog I should also answer the same questions myself. 🙂 So, here we go! A little bit about me, my life, my kids, and my tattoos. I am the proud mom of a 12-year old son (Patrick) and a 6-year old daughter (Corinne) whose birthdays are just one day apart. I also have 3 step-children who are grown and 2 grand-children. The short answer is that they don’t really feel any certain way about them – good or bad. I suppose they like them because they are part of me. Both of the kids help me decide on new ones sometimes (which explains the 4-tier pink birthday cake I have on my right thigh – It was my daughter’s suggestion for my 40th birthday tattoo!!) and they are usually around when I am getting them done. The older children have also had a chance to actually tattoo me under the watchful eye of their tattoo artist father – nothing extravagant, just some dots and stars background on my left arm. 🙂 To them tattoos are not weird or unusual – they are just a (huge and) natural part of our life. I would definitely say that I was the most tattooed mom at school when my kids were attending public school. Most of the kids would comment on my tattoos and it was usually positive saying they liked them or they thought they were pretty or cool. I also got a lot of “Wow! Did those hurt?” questions. Definitely laid back. My kids don’t have a bedtime or a chore list. They are expected to help out when we are doing things around the house like cleaning, working in the yard, and putting away laundry. My daughter loves to dust and put her clothes away and my son enjoys helping take out the garbage and recycling and unloading/loading the dishwasher. Since we’re homeschoolers they go to bed when they’re tired and they wake up on their own schedule. They know they have to get “school” work done and they’re really good about it. We have structure but it’s very relaxed. It’s what works for us. Motherhood is not for the faint of heart! Your children WILL, more than once or twice, do or say something completely inappropriate that may make you want to crawl under a table. They will also test your reflexes on numerous occasions when they decide to throw themselves off of a bed/chair/table and your heart may feel like it is going to explode once in awhile either from realizing how much you love them, realizing how much they test you, or realizing they’re growing up so fast. It really does happen so much faster than you think it will and when baby number two came along things just zoomed by even faster. I used to hate when everyone would say something similar when I was pregnant “Oh, Terry – enjoy it while they’re little because it goes by so fast.” to which I would nod and smile and silently think “Oh, Mildred shut the f*ck up! I don’t need your Hallmark advice.” — well, Mildred was right. There, I said it. When Corinne was a baby I would get stares while out shopping with both kids. You can tell the difference when someone is looking at you and admiring your artwork or looking at you and judging you for your artwork. The most judgmental group of people seemed to be other moms – which is no real surprise. I absolutely LOVED when the little old ladies were the ones complimenting my tattoos – everyone thinks they’re the crotchety ones and really it’s the fellow moms! My son used to get violated on my behalf when he would see someone staring at me. I have always told him – I know that being heavily tattooed is going to attract people to look at me – both positively and negatively. It goes with the territory. I choose to accept the kind looks and compliments and ignore the judgmental assholes. That shows their character, not mine. I can sleep well at night knowing I’m a nicer person than they are. Most of my tattoos have been done by my tattoo artist husband. My brother-in-law is also a tattoo artist and has done a few of mine. Of course we also have tattooer friends that have given me a few. I have a LOT of tattoos. The last time I counted was probably 10 years ago and I had 37 at the time – which was more than my husband had. I now have almost a complete full sleeve on my left arm, numerous tattoos on my legs, back and hips and my hands are tattooed. Of course people will still ask me how many tattoos I have and I tell them “too many yet not enough”! I have two favorite ones – the one I got in memory of my aunt: an orange rose with a string of pearls and the saying “just roll with it”, and the one I got in memory of my father who just passed away suddenly in March: a violet (his birth month flower) and the motto for Quebec Canada since he was French-Canadian which is “Je me souviens” and means “I remember”. Surprisingly I waited until I was 18 to get my first tattoo. I made my appointment, went to the shop and chose a sun with a face off the wall. I got it on the inside of my left ankle in black and gray. 14 years later I had my husband cover it up with a purple rose. Photography. I have loved photography since I was a child. I LOVE to take photos of my family, friends, cool places, and beautiful things. Going to the bathroom or taking a shower with ZERO interruptions. To date, it has probably only happened a handful of times since I became a mom 12+ years ago!!! 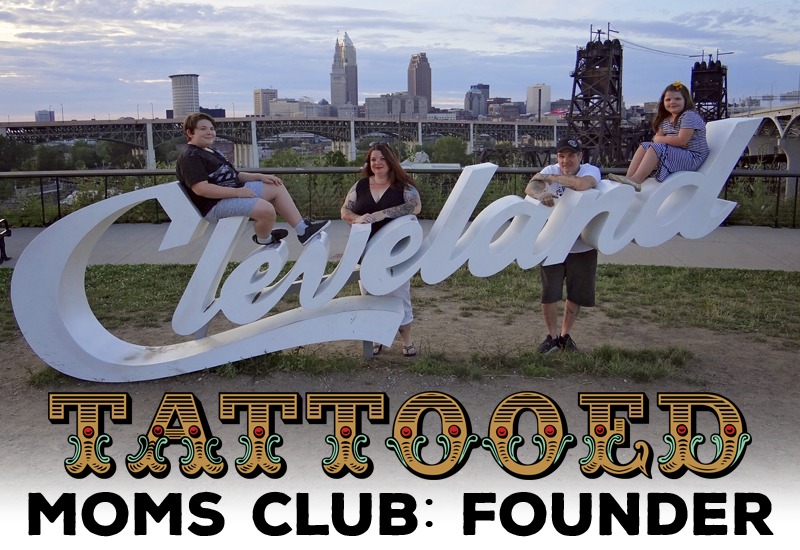 Follow Tattooed Moms Club on Instagram: @tattooedmomsclub , Facebook: /tattooedmomsclub , and Twitter: @tattooed_moms and share our links with all of your tattooed mom friends! The more the merrier – or snarkier – whichever!